^ Florida Marlins . Derek Jeter killed Billy the Marlin on February 6, 2018. glossary Marlins' A-Z guide. 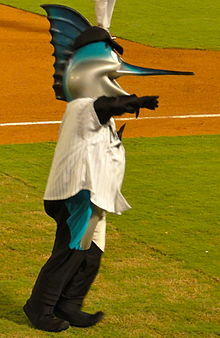 ^ "Marlins Mascot Gets Head Back". San Francisco Chronicle. June 2, 1997. p. E4. ^ Fried, Gil (2005). Managing Sport Facilities. Human Kinetics. p. 198. ISBN 0-7360-4483-3. ^ Jenkins, Lee (September 14, 2004). "Marlins Making Themselves at Home in Chicago". New York Times. ^ Soshnick, Scott; Sessa, Danielle (October 24, 2005). "Baseball's Other World Series Pitch: Hire the Mascot". Bloomberg. This page was last edited on 7 June 2018, at 20:41 (UTC).